My, what an “attractive nuisance” you have. Recently, while attending a friend’s graduation, I was asked by their guests as to why all the pools they saw in Florida had pool cages. It reminded of me of the attractive nuisance doctrine and its significance in the pool filled state of Florida. The doctrine of attractive nuisance is intended to place a burden on property owners, to in effect, protect children from dangers they are not old enough to appreciate. In summary, one who maintains or permits a condition on their property, that can reasonably be expected to attract young children, must use reasonable care to protect the children against the danger.The property owner is liable only where they knew, or should have known, that a condition existed that was alluring to children. I’m not a child anymore, but I do know that every time my daughter sees a pool, she is very much tempted to jump in it. Therein lies the premise of the attractive nuisance doctrine. 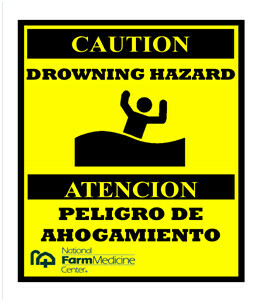 To limit your legal exposure, property owners should post warning signs that not only state the danger, but actually show the danger with illustrations (see picture above). However, in the case of very young children, even that may be insufficient. Bear in mind that the attractive nuisance doctrine is intended to apply to cases where the danger is “hidden.” It doesn’t apply where the child’s age, intelligence, and knowledge shows that they have the ability to recognize and appreciate the danger involved. On another note, an attractive nuisance can also be found where a person abandons or discards, an airtight unit, without first removing the doors. Abandoned objects from which the doors have not been removed are presumed to be an attractive nuisance and a menace to the health and safety of children. It’s better to be safe than sorry. We all have a duty to act reasonably to protect those who cannot protect themselves; especially children. Posted on May 22, 2013, in Legal and tagged Attorney, Attractive Nuisance, Bonita Springs Real Estate Attorney, Cape Coral Real Estate Attorney, Doctrine of Attractive Nuisance, Estero Real Estate Attorney, Fort Myers, Fort Myers Real Estate Attorney, Lawyer, Legal Schmegal, Property Guiding, SWFL Real Estate, The Guirguis Law Firm, Vernon Guirguis. Bookmark the permalink. Leave a comment.